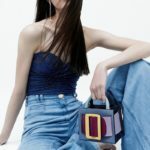 Upgrade your new season wardrobe with these cool, easy looks from your fave Aussie labels: The Fifth Label, C/Meo Collective, Keepsake, findersKEEPERS, JAGGAR, and more. Shop Cool Australian Designers Pre-Fall 2017 collections at SHOPBOP.COM. A daring playsuit that’s also dance floor-approved. Remix your office uniform with an asymmetrical snap-front skirt.